Discussion in 'Weapons, Technology & Equipment' started by von Poop, Mar 14, 2006. During the Bosnian war a number of M36 Tank destroyers dating back to the second war were used in anger again. An article I read recently referred to PTRD AT Rifles being used by the Albanian army as late as 1980. There were even first war vintage FT17 tanks in defensive use in the Russian conflict in Afghanistan. The Syrians used a handful of Pzkpfw 4's as late as 1967. This has got me thinking about the longevity of some ww2 weapons systems, has anyone got any other examples of exceptional survivors (of any kind of weapon or equipment) fighting on long after their theoretical obsolescence? There's got to be a Vintage T34 out there fighting still, anyone spotted one? 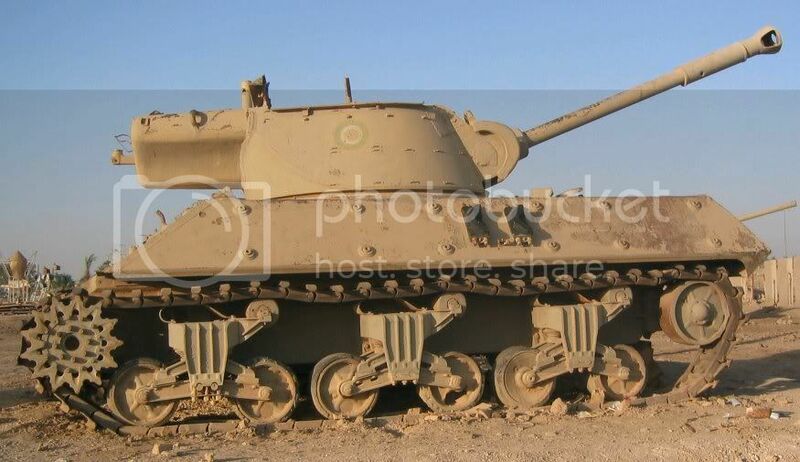 Well, how about this which looks american WW2 vintage and seen in Southern Iraq in 2003. M36 Jackson/Slugger? (standard, B1 or B2 i'd have to check) Very very nice. so that's 1944-2003. Way our MOD is playing expect to see squadrons of Lancs/Lincolns and every Spitfire back in the sky very soon. And Bovington museum could find it's collection commandeered. I would have thought that this subject would have mustered a little more interest as it is to do with a more 'living' history than the usual theories and ideas that are posted on this forum. Maybe people's interest doesn't streach to the resent past? Although I would have thought that being able to see equipment from that era in working or near working order recently would be an attractive idea. How about the 1911 Colt?, that's a design that hardly seems to have changed in military use for nearly 100 years. It's not the same place. As for the Colt .45, It's not still on service as the US issue side arm.... the Browning 9mm HP however is still in us as the issue side arm for the British and the Belgian armed forces. It's a question of is the weapon in use, or in service? I think Service is more interesting, surely the 1911 still crops up in a regular army somewhere? I saw pictures of the serbs and croats and bosnians and bulkan fighters with PPSH-41 sub-machine guns in pictures taken during the balkan conflicts of the 1990's....i mean 5 million of those things were made in 4 years...they dont just disappear! The israelis were using the Sherman well into the eighties, they seemed to have endless upgrades to it. There is also the Good old Goony bird! which is still flying around the world, albeit not in military service! 'City of Lincoln' should qualify as Still in service, I sometimes wonder how much of her is still original and how much newly manufactured parts. I like the ppsh suggestion, can't say i've noticed 'em so i'll have to look a little closer. Good website here about Israeli weapons. They were still using the M3 halftrack in 1982. The story of their Sherman-aquiring was a fascinating one too, I think Patrick Wright's 'TANK' book covered it well, jamming in old French Ordnance and whatever else they could lay their hands on. Actually, I think a number of third-world air forces still use them, both in the AC (counter-insurgency) and transport roles. South Africa had a bunch. Well I know that Bren Guns were used by the Irish RDF (Reserve Defense Force) until several years ago and they were missed by all when they finished up! Yeah, but this is all amateur stuff. The oldest piece of military hardware still in service, as far as i am aware, is HMS Victory, which is still a commissioned warship. I didn't know the C47 was still in usage around the world. Wasn't it also known as the Skytrain, or am i getting it mixed up with another C plane? Yes the Skytrain or the more familiar "Gooney Bird".